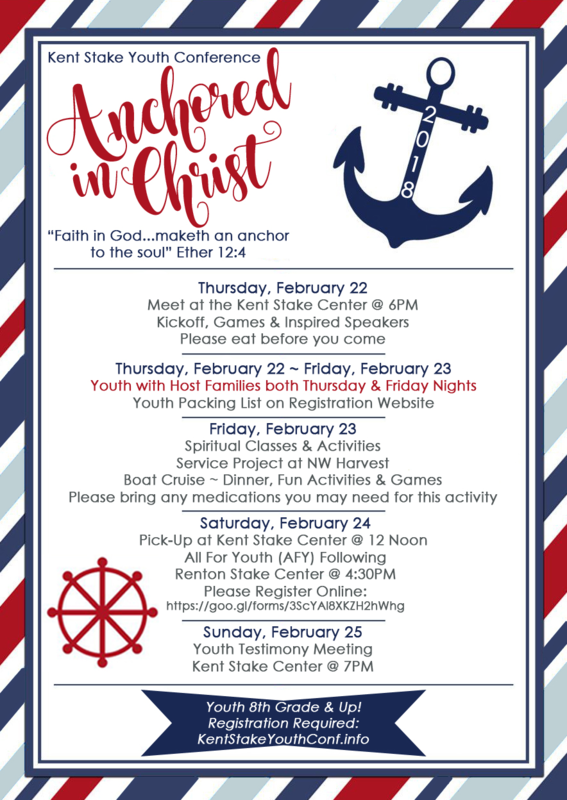 Stake Youth Conference will be begin on Thursday, Feb. 22 at 6:00 PM at the Kent Stake Center (KSC) and run through Saturday, Feb. 24 ending at 12:00 PM at the KSC, with a youth testimony meeting on Sunday, Feb. 25 at 7:00 PM in the KSC chapel. Youth will be assigned to host families for Thursday and Friday night, so please see the youth conference packing list for a detailed list of items to bring. Youth in 8th grade and up are invited to attend. Note: All for Youth (Renton Stake) follows the last youth conference session on Saturday. Check-in begins at 4:30 PM for Mia Maids, Teachers, Laurels, & Priests. Pre-registration required; click here to register now (complete by February 11th).